Nearly every building professional and DIYer is familiar with DAP products. Their Alex Caulk is one of the most popular brands of sealant sold at big box stores nationwide. We’ve also reviewed DAP DynaGrip construction adhesive which is an advanced product for flooring and similar uses. 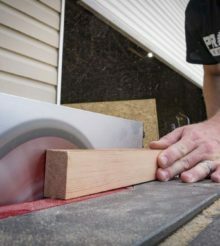 That product actually won a Pro Tool Innovation Award in 2017. They even make a “superglue” called DAP Rapidfuse. DAP DynaFlex Ultra is an exterior sealant designed for use with windows, doors, and even vinyl siding seams. It’s particularly good at taking care of the places where HardiBoard meets window trim. As a window and door sealant, the key feature is that it stays permanently flexible, so it adapts to changes in weather that cause other sealants to crack or split. DAP says DynaFlex Ultra uses Weather Max technology. This is a trademarked name for their flavor of UV protection, flexibility, and resistance to dirt that makes this a reliable product for handling anything from intense sun exposure to extreme cold and rain. The UV resistance, in particular, resists color fading, yellowing, cracking, chalking, and crumbling. DAP does a pretty good job of hyping up the benefits of DynaFlex. Once cured, DAP DynaFlex Ultra is designed to resist mold, mildew, and algae for the life of the sealant. It creates a permanent waterproof seal that stays in place throughout the expected contraction and expansion of building materials throughout the seasons. DAP DynaFlex Ultra can handle exposure to rain AND can be painted just one hour after application. Immediately upon inserting the tube and clipping a 1/4-inch hole in the nozzle, I noticed that the sealant flowed immediately. There’s no foil seal inside the tube to puncture, and DynaFlex flows much easier than traditional caulk. It also stops when you back off the applicator. Not all of us run with a Milwaukee cordless caulk gun, so ease of use means something. The gap around our office door and vinyl trim became the first use we had for the DynaFlex. It went on easily, and I loved the way the sealant flowed. It went in much more easily than traditional Alex caulk or even 230, but it remained easy to control. I never felt as if the flow got away from me—unless I forgot to back off the applicator. The DAP DynaFlex Ultra sealant was also helpful for a 1920s bungalow that had been redone with HardiBoard siding. While the siding looks great, and the remodeled house remains in excellent condition, much of the window trim needed a touch-up. In many places, the original caulk had shrunk, cracked, and/or split. Taking some time to re-apply new DynaFlex sealant to those areas in preparation for repainting became easy to prioritize. Of course, summer in Central Florida means rain—lots of it. The two-hour window on the DAP DynaFlex Ultra Window and Door Sealant allowed us to find a break in the rain and get the work done quickly. In some cases, it rained just over an hour after application. Going back over the work, this didn’t seem to affect the job one bit. In comparing DAP DynaFlex Ultra vs DynaFlex 230 a couple key things reveal themselves. For one, DynaFlex Ultra is more flexible, having a movement rating of Class 35 (except Clear) vs the DynaFlex 230 rating of Class 25. DynaFlex Ultra is simply more flexible—and remains so. It also has great UV resistance to yellowing. That same resistance gives it a longer resilience against hardening, cracking, or splitting. DAP DynaFlex 230 is currently available in a wider range of colors than Ultra, however, it has been out longer. It also fills larger gaps. Both products are latex-based and clean up easily with water. When you’re talking about window and door sealants, you want to choose wisely. Picking the wrong product will cost you in the long run. You’ll invariably have to go back and re-seal that door trim, window borders, or other areas. DAP runs about $6.28/tube or $75.36/case. It most commonly can be found in White and Beige, but you can also order it in Clear, Clay, Dark Bronze, and Iron Gray. Because it stays permanently flexible (we checked it weeks later) this product makes a lot of sense for filling in gaps up to 3/8″. I wish I had used it on prior products as it would have saved me lots of time. The price and ease-of-use make it an easy recommendation, and we feel DAP has provided a product that delivers premium performance. If you want “builder grade” DynaFlex 230 is your product. For better UV protection and weatherproofing, DAP DynaFlex Ultra seems to deliver. You can find more information about DAP DynaFlex Ultra here. Dyna 230 and vinyl windows/doors work terrible together. Dyna 230 water is also a no go unless you are laying and cleaning 12” at a time.